Vizio SmartCast Entertainment Ecosystem | SmartHomesNow! VIZIO, Inc. announced the launch of VIZIO SmartCast, its next generation smart entertainment ecosystem which will span displays, sound bars and standalone speakers. VIZIO SmartCast debuts on the all-new P-Series Ultra HD HDR Home Theater Display collection, the first Ultra HD and High Dynamic Range offerings to fully integrate Google Cast technology. The displays are controlled by the VIZIO SmartCast app that comes preinstalled on the included 6″ 1080p Android™ Tablet Remote. P-Series marries its intuitive smart features with unmatched picture quality technologies that were first brought to market on the VIZIO Reference Series. The VIZIO SmartCast app turns every mobile device screen into a remote control and represents a paradigm shift in content discovery. Instead of jumping between apps, VIZIO SmartCast allows users to search and browse content first by genre across multiple apps at once, then select the app or source to play the content. The app also simplifies on-screen navigation. Rather than struggling to see and adjust settings or navigate apps from across the room, VIZIO SmartCast users gain access to all menus and playback controls through the app. With the VIZIO SmartCast app available for download on iOS and Android devices, consumers will never have to deal with a lost remote again. The VIZIO SmartCast P-Series Ultra HD HDR Home Theater Display boasts the same advanced picture quality technologies first released on the 2015 VIZIO 120″ and 65″ Reference Series. Ultra HD featuring High Dynamic Range with Dolby Vision content support transforms the entertainment experience with dramatic imaging, incredible brightness, contrast and color that brings content to life. New release titles such as In the Heart of the Sea and Point Break continue to roll out through video-on-demand services like VUDU, which currently has more than 30 Warner Bros. titles available in the Dolby Vision format. In addition to High Dynamic Range, Ultra Color Spectrum provides a wider color gamut enabling impeccable accuracy in every hue and tone, allowing more realistic colors than ever before. The P-Series also features powerful Full-Array LED backlighting with up to 128 Active LED Zones® which dynamically adjust to on-screen content for deeper, richer black levels and more accurate contrast. 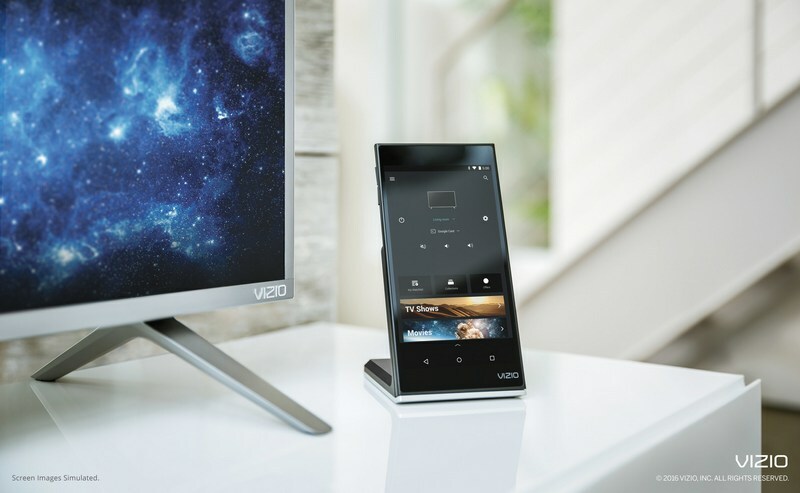 Each VIZIO SmartCast P-Series Ultra HD HDR Home Theater Display includes a 6″ Android Tablet Remote with a convenient wireless charging dock, putting consumers in control of their entertainment. The tablet remote comes pre-installed with the VIZIO SmartCast app and features Full HD 1080p resolution, Android Lollipop OS, a powerful V8 octa-core processor, integrated stereo speakers and 16GB of storage, making it a great standalone tablet as well. Consumers can enjoy games and other apps, available for download from the Google Play store2, on the device. With Google Cast built in to every VIZIO SmartCast device, consumers can access thousands of mobile apps they already know and love. By simply tapping the Cast button, consumers can easily watch content go from their mobile screen to any VIZIO SmartCast or Cast-enabled device on their home WiFi network. And with casting over WiFi, users can still multi-task on the P-Series included tablet remote or their own mobile device without interrupting what is casting on the display. VIZIO SmartCast makes its debut on the P-Series Ultra HD HDR Home Theater Display with additional collections and products to follow. P-Series is available now with more information and retailers available at VIZIO.com.